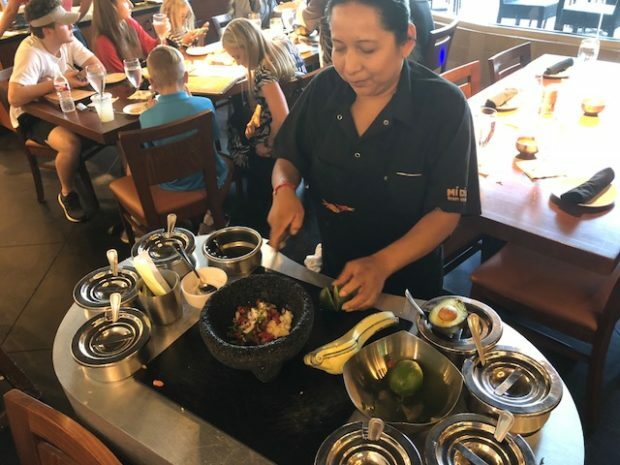 Welcome to Mi Dia – where everything is made from scratch! 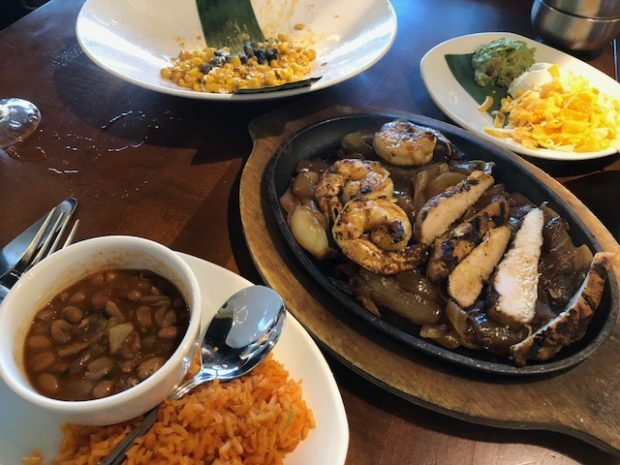 I’m always looking for Tex-Mex spots to visit in DFW, and Mi Dia is one to add to the list. The restaurant fuses Tex-Mex with Sante Fe flavors to bring customers food and beverages influenced by Mexico City. Overall, the menu is diverse and offers your favorite Mexican comfort food. 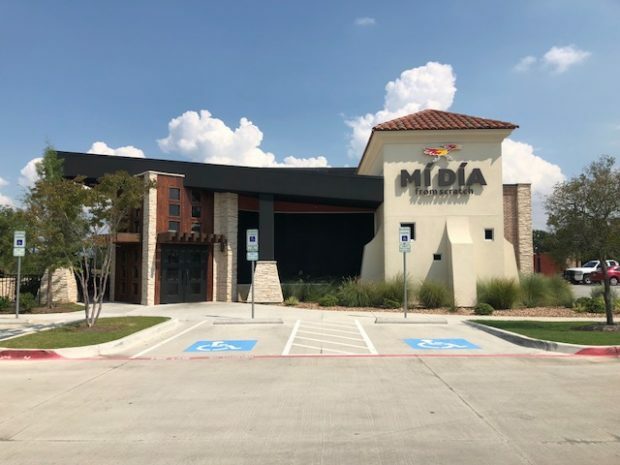 Mi Dia is family friendly and currently has three locations in North Texas: Plano, Grapevine and Flower Mound. 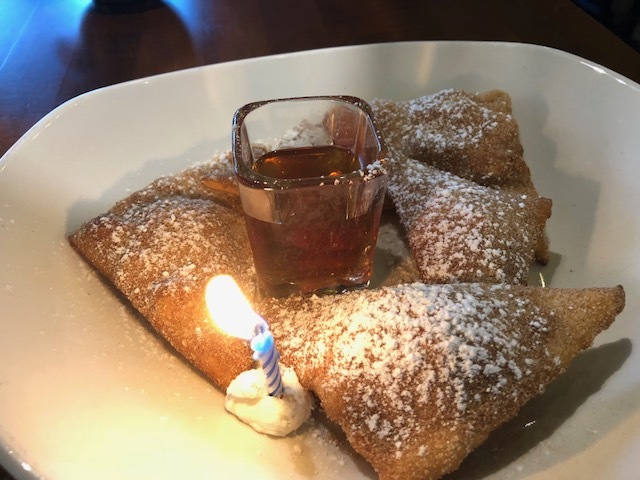 My guest and I visited the Flower Mound location for brunch this month to sample the menu items and to celebrate my birthday. See what we eat and drank below! My visit was during the weekend, so YAY for brunch. Right away I ordered signature Bloody Mary made with Tito’s vodka and topped with olives, a strip of bacon and a jumbo cocktail shrimp. 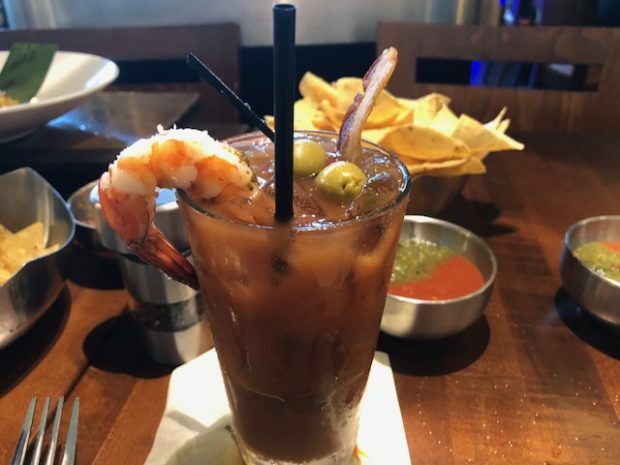 Fun fact – you can also order the Bloody Maria made with El Mayor Tequila Blanco! Each month, the restaurant debutes a new margarita just for a limited time. 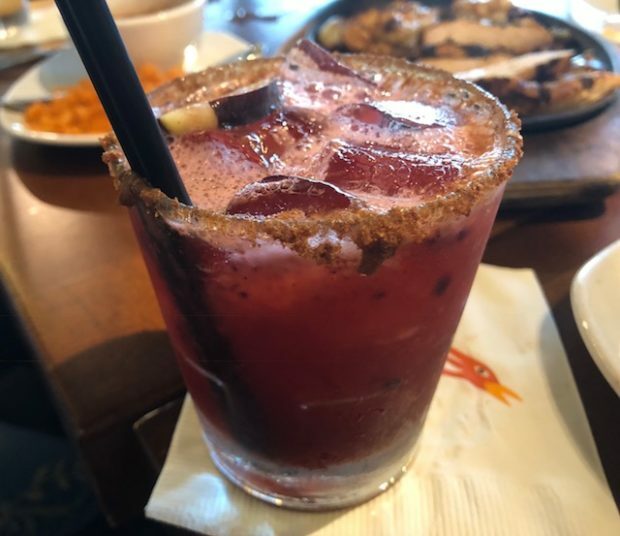 The Fig and Blackberry Margarita is a refreshing drink that welcomes the fall season with open arms. I enjoyed both of the flavors in this unique drink. The margarita list features more than a dozen selections with many different fruits… you are bound to find several of them to like! If you’re a huge fan of tequila, I’d suggest ordering a tequila flight starting at just $9 for three tastes. Start with tableside guacamole – a delightful appetizer for the whole table. 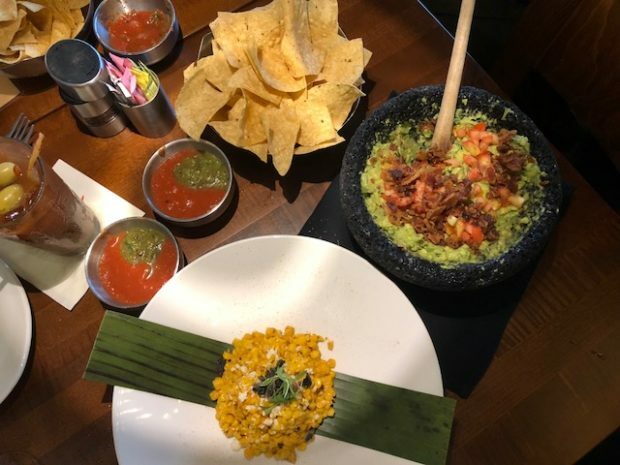 The server used two large avocados, and you can choose from a handful of ingredients to customize your guac. including bits of bacon, sun-dried tomatoes, onions, peppers and herbs. The price tag is $15, but it’s worth every penny. Another great starter to consider ordering is the Esquites. The creamy, roasted corn is a delicious way to whet your appetite for what’s to come. From breakfast tacos to chilaquiles, you’ll find staple Tex-Mex brunch options at Mi Dia. But if you want to try something different, you’re in the right place. Items like the Belgian Waffles with agave syrup and the Arrachera y Huevo Estilo, pictured below, are worth a bite. 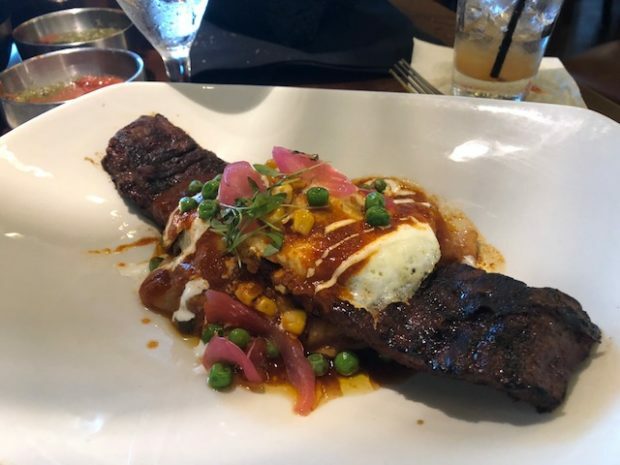 The wood grilled skirt steak was tender and flavorful. 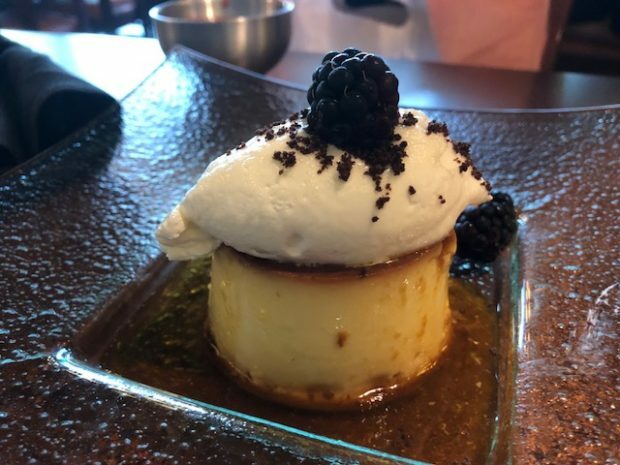 Topped with a fried egg and a chile arbol reduction, this entree was absolutely delicious and filling. Since it was my birthday, the server surpised me with a candle when I ordered the sopapillas. How sweet! This pastries is dusted with sugar and cinnamon and comes with a lot of honey in a cute glass. If you’re looking for ice cream and want a sweet tequila finish, order the Blueberry Tres Generaciones Tequila Ice Cream (not pictured). All of the ice cream flavors are homemade, adding to Mi Dia’s made-from-scratch options. To learn more about Mi Dia, visit their website here.